Sunil Sharpe’s Dublin-based imprint Earwiggle has a strong physical connotation in its pursuit for electronic music. They press vinyl (digital also available) and prefer sounds that don’t leave people just standing at the wall. Recent example is “The Angel Maker EP” by Dez Williams, succeeding the brilliant “Midwest Whippersnappers EP” by Freddie Fresh and Paul Birken. 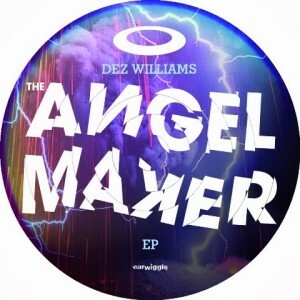 As a techno artist Dez Williams goes in “The Angel Maker” beyond the generic 4/4 stuff and even in the harder cuts he’s not afraid of using softer pads. However the opener “Underground Persistent” offers smoking acid house, hitting up the pulse with a classic bass line and after that hardened beverage is served with “Untitledacid6” which will please the acid techno faction. Deep and kicking drum set has a pivotal role in “Freedom” which, however, is spoiled with an endlessly looping vocal sample. A new page is turned in “Courtesy Call”, a surprising conclusion seeing Williams playing around with electro beats not far from Dopplereffekt. A party tool for the night.